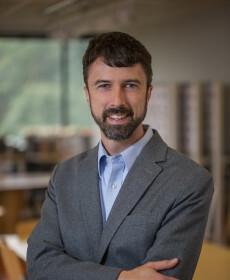 Kieran has focused on educational design for the last two decades, managing and leading design teams on collegiate and K-12 projects throughout the region. Kieran brings his deep experience to all phases of project design and construction, working closely with clients and user groups from the outset to build consensus and establish expectations that inform the design process and ensure efficient, effective and thoughtful outcomes. He is passionate about engaging students and teachers in the design process, understanding their unique perspective on learning, and how their experiences and insights can shape environments to help them thrive. This passion carries through to Kieran’s work in teaching classes and guest speaking in both K-12 and Higher Education settings, giving workshops, running outreach programs, and directly mentoring students. Kieran brings a strong commitment to sustainability and has delivered many LEED-certified projects that successfully embody each client’s unique value system. He is active in national conversations relative to advancing education through organizations such as SCUP, USGBC, and the AIA, as well as collaborating with partners such as Steelcase’s Innovation in Education program. Kieran serves on the Board and Architectural Committee of Montgomery County Public Schools’ Foundations Program, the organization responsible for CTE programs throughout the County. A key project of the program is working with architecture students to design a single family home that will then be built by students in the construction trades program.